I have a feeling this weekend will be busy for many of us. First of all, Sunday is Father's Day. We have a cookout planned with all the fixin's and plenty of family members on the guest list. Secondly, it's going to be sunny and hot (and humid, as I've mentioned previously). Outdoor work and play will need a proper remedy, which means keeping hydrated and cooling off with frosty treats. 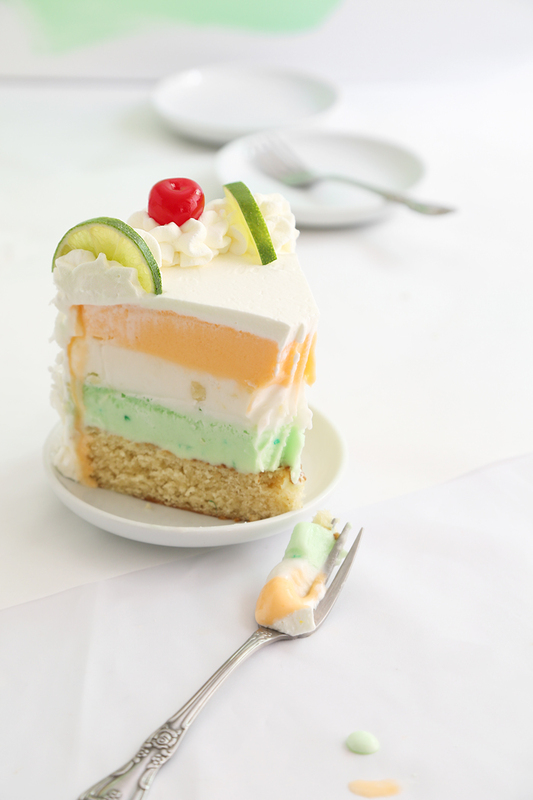 That's why I decided to make this Tropical Sherbet Cake. It's so refreshing, like air conditioning on a cake stand! Someone recently asked me what the difference between sherbet and ice cream was, and I found myself stammering a poorly articulated answer: "It's like ice cream but less milky. It's fruitier. It's a little bit like sorbet but with milk in it." I was right, but my answer was confusing. I could tell by the furrow in my friend's brow. So here's the gist of it. Ice cream contains almost 50% milk or cream. It is dairy based. Sherbet has only 1%-2% milk or cream. It is fruit based using fruit puree or fruit juice. Sorbet usually contains no milk at all, it is fruit and sweetened water based (unless you're a rule-breaker - heh!). Then there's the whole pronunciation. Sherbet. Sher-bert? Sher-buht? The latter is more accurate, but that's not important. Let's just call it delicious. You can use your favorite flavors of sherbet in this recipe. I chose orange, pineapple and lime. The cake portion is flavored with pure orange oil and orange zest. It's fluffy yet sturdy and its texture isn't compromised during freezing. It's a great little single 9-inch cake recipe. The frosting is sweetened whipped cream with a touch of vanilla added. 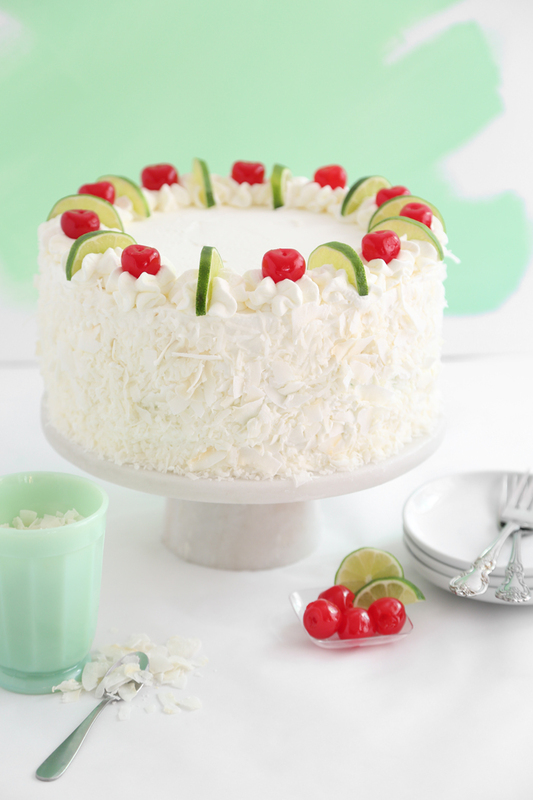 I used a combination of sweetened flake coconut and unsweet large shred coconut on the outside of this cake. 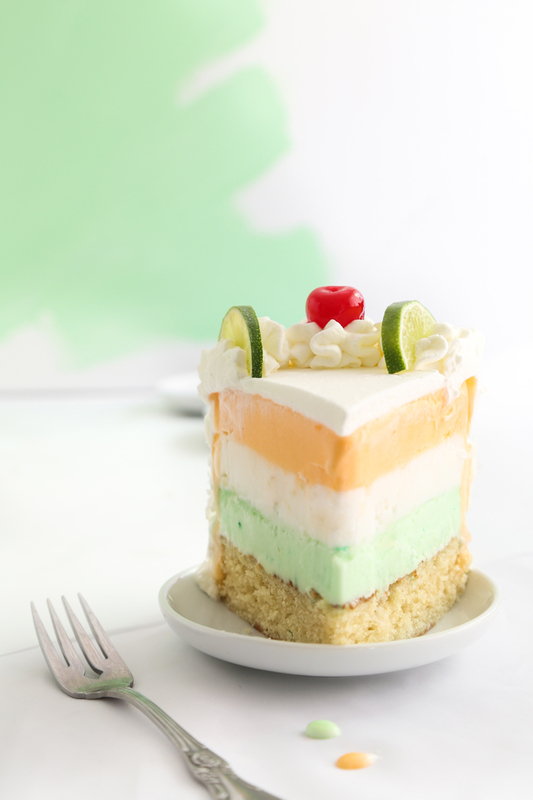 Sherbet is sometimes used as a palate cleanser between meals (much like sorbet), so eating a slice of this cake feels deceptively light. I polished off a large slice and could have eaten a second one straight away. This cake slices beautifully! If you've ever served sherbet, then you know how delightfully it yields under an ice cream scoop. This cake is no different. The knife glides through the sherbet layers like a dream. This cake needs to be stored in the freezer, so make adequate room beside the frozen veggies before you begin the recipe. Whenever I make frozen cakes, I like to store them in the freezer on my marble cake stand. The marble retains the cold, so the cake is less prone to melt quickly when you remove it from the freezer for serving. I found my stand years ago at a discount store, but there are many affordable options for purchase online (like this one). Begin this cake one day ahead. Soften the sherbet to thick milkshake consistency. It should be spreadable and not liquid. Don’t leave it to soften unattended for too long because melted sherbet will separate into a fruit juice and cream layer, and you’ll have to buy more sherbet (lesson learned from experience - oops!). Make the cake: Line three 9-inch cake pans with double thickness of plastic wrap. Cut the plastic wrap long enough so that it over hangs the sides of the pans. Press the plastic wrap into the pan well. Spread each flavor of sherbet into 9-inch pans evenly; freeze pans for 6 hours or overnight (preferred). 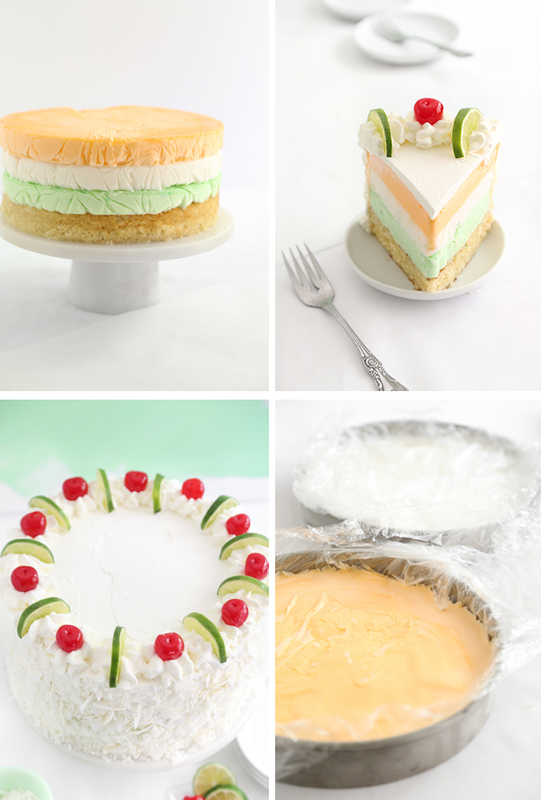 Remove the frozen sherbet rounds from the pans by pulling them out by the plastic wrap and store them stacked in the freezer while you prepare the cake portion. Preheat the oven to 375°F. Grease and flour a 9-inch round cake pan. Beat the sugar, salt and oil together using an electric mixer. Add the egg, orange essence and zest; beat well. In a separate bowl, mix together the flour and baking powder. Add the flour to the beaten mixture alternately with the milk, beginning and ending with flour. Pour the batter into the prepared pan (if you have Bake Easy strips – use them now!). Bake for 25-30 minutes, or until the cake tests done with a toothpick. Rest the cake in the pan for 5 minutes before turning out on a wire rack to cool completely. 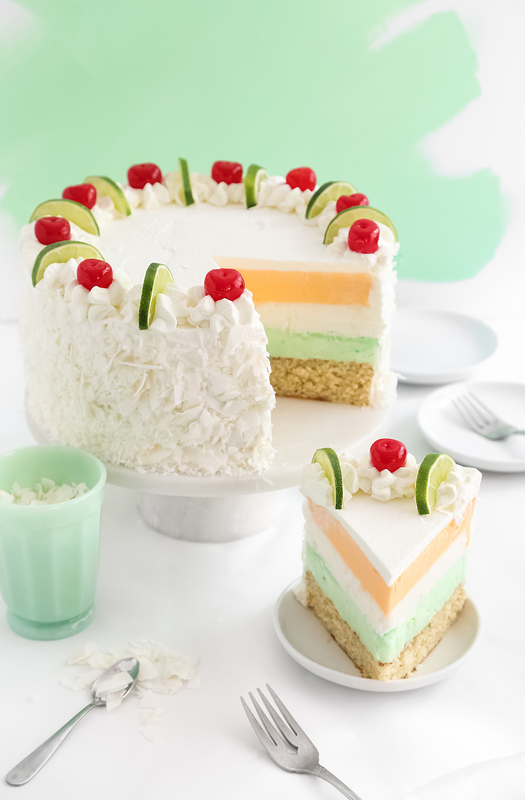 When the cake is cool, stack it on a cake stand or serving plate with the frozen sherbet. You may order the sherbet flavors as you like. Mine was ordered: cake, lime sherbet, pineapple sherbet and orange sherbet on top. Store the stacked cake in the freezer while you make the frosting. Beat the heavy whipping cream on high speed with an electric mixer. Add in the sugar a little at a time, followed by the vanilla extract. Beat until thickened and fluffy. Remove 3/4 cup of the frosting and transfer to a piping bag fitted with a star tip. Remove the cake from the freezer and cover with frosting. Set the cake on a large baking tray and press sweetened shredded coconut into the sides of the cake. Repeat the procedure with the unsweet large shred coconut. (You may have leftover coconut on the baking tray, transfer it to a zip-top bag and save for later use). Use the reserved frosting in the piping bag to pipe 20 rosettes around the top edge of the cake. Garnish every other rosette with a maraschino cherry, and garnish the remaining rosettes with a halved lime wheel. Store the cake in the freezer. Wow! That looks amazingly good! Thanks for sharing! I love all your posts. The bright images and the pastel shades are so beautiful. You make the simplest ingredients look so amazing. I love the contrast with pastel and fresh colors. You are right when you say its like air conditioning on a cake stand. Thanks for sharing this awesome recipe. Thank you for mentioning our family pets. It breaks my heart to see dogs that are left outside when I walk my own little babies. I know mine will be going home to a nice cool house with lots of cool water and I don't always believe that for the the little creatures I see when walking. I have made my own fair share of calls to our local humane society and it breaks my heart when told there is nothing they can do as long as water is provided. I have even make ice cubes and taken them and thrown over fences. I know, it isn't much, but it is something. It looks very delicious and yummyyy. Thank you for sharing recipe also. I always order birthday cake online for my kids, but this year I will definitely gonna try this.